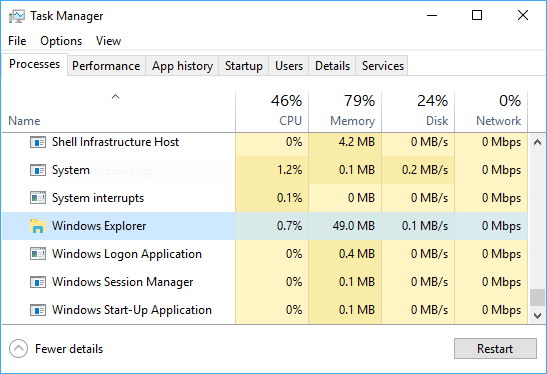 The explorer.exe, or simply Explorer, is one of the prominent process viewable in Task Manager that is constantly and always running, and is commonly assumed as the Windows Explorer or File Explorer (in Windows 10). But the explorer.exe process is much more than just Windows Explorer or File Explorer. Explorer.exe is the default shell for Windows operating system, and is responsible for providing a graphical user interface for accessing the file systems. It is also the component of the operating system that presents many user interface apps, such as Start menu, Taskbar, Desktop, and Windows Explorer or File Explorer. Thus if the Explorer is stopped or removed, the GUI for Windows will disappear, and you will see a blank and black desktop with just mouse pointer. If you’re encountering issues with Windows’ shell, or other graphical user components such as Taskbar or Start menu, it’s possible to restart the Explorer to reset and refresh the Explorer process, instead of restarting the computer. In addition, some changes to GUI of Explorer may also require a restart of Explorer.exe in order for the changes to take effect. Here’s a few ways on how to restart the explorer.exe in Windows 10. Open Task Manager by pressing Ctrl + Shift + Escape keys simultaneously, or open Win+X menu and select Task Manager. Click or tap on More details to expand the Task Manager. Select Windows Explorer in the Processes tab, and then click or tap on the Restart button at the bottom. Alternatively, right click or tap and hold on Windows Explorer and select Restart. Windows Explorer appears under “Windows processes” section if you’re not running File Explorer. However, if you open File Explorer, Windows Explorer is listed under “Apps” section. Press and hold the Shift + Ctrl keys, and then right click or press and hold on the Taskbar. Click or tap on the Exit Explorer from the context menu. At this point, the Explorer is stopped, and GUI items become blank and desktop becomes black. To restart Explorer service, open Task Manager by pressing Ctrl + Shift + Escape keys simultaneously. Click or tap on More details to expand Task Manager. Click or tap on the File on the menu bar, and then select Run new task. Type explorer.exe, and hit Enter to start the Explorer afresh.